^ U.S. Gazetteer Files 2010: Place List. U.S. Census Bureau. [April 9, 2013]. ^ Population Estimates. United States Census Bureau. [June 2, 2013]. 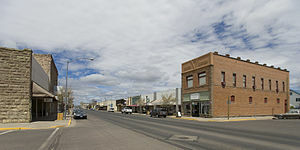 ^ Geographic Identifiers: Burns City, Oregon. American FactFinder. U.S. Census Bureau. [April 8, 2013]. ^ Burns. Geographic Names Information System. United States Geological Survey. November 28, 1980 [April 8, 2013].